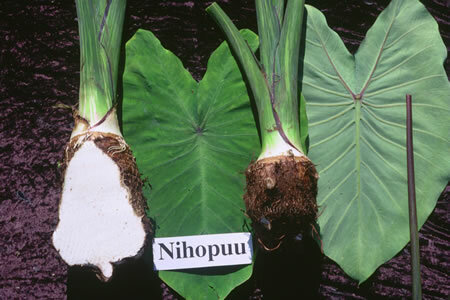 General Characteristics: Medium in height to tall, moderately spreading, maturing within 12 months, producing from 5 to 10 oha; identified by light and dark green-striped petioles and distinct purplish-black edges. Petiole: 75 to 90 cm. long, light and dark green-striped, the light green predominating, conspicuously purplish-black at edge, white to greenish-white at base. Leaf blade: 45 to 50 cm. long, 30 to 35 cm. wide, 35 to 40 cm. from tip to base of sinus, sagittate, indistinctly light and dark green-mottled; piko purple; lobes acute with deep, narrow sinus. Corm: Flesh white with yellowish fibers; skin white. 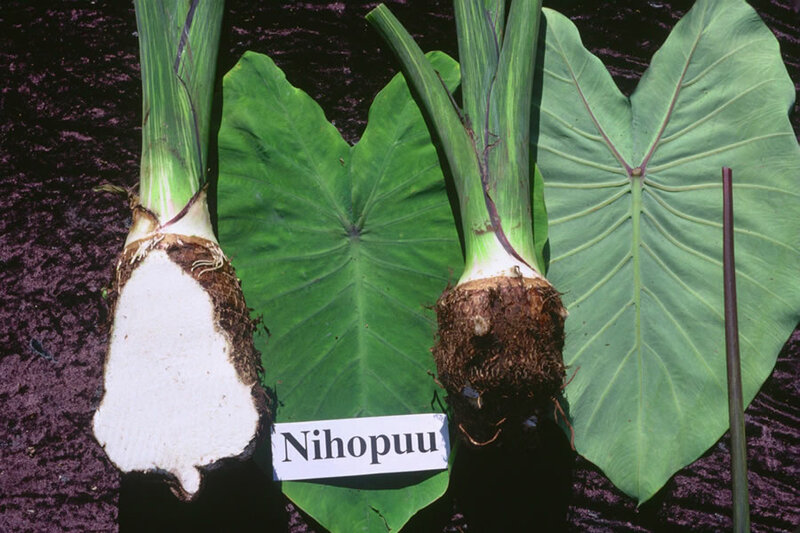 Origin, and derivation of name: Native variety, collected at Ewa, Oahu; the derivation of the name is unknown. Distribution: Rare; formerly grown to considerable extent in valleys near Schofield Barracks. Use: Makes a light-colored poi of good quality. Remarks: This variety is said to be susceptible to soft rot soon after maturity, necessitating early harvesting.